After reading the last couple of posts, my friend Kathy told me that she wanted to go grocery shopping with me! Hahaha! 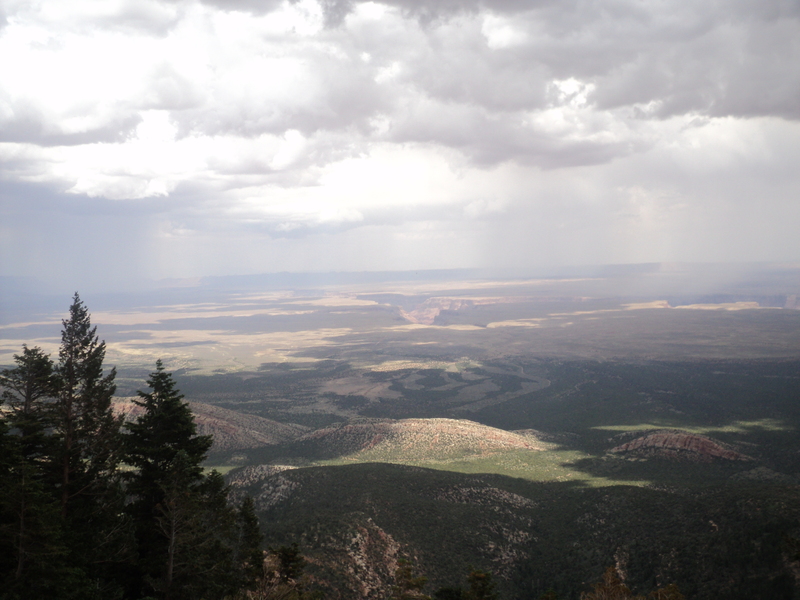 I sort of dismissed the idea, because I thought that it would probably be really, really, really tedious for her, and didn’t want to subject her to three or four hours driving hither and thither, reading endless labels. Selfishly, the more I think about it, the more I like it, just so I can enjoy her sweet company. 😀 So, is it a date, Kathy??? This three-for-the-price-of-one entry comes to you courtesy of Trader Joe’s. I really love Trader Joe’s. A friend who recently started eating healthier visited a local TJ’s and was overwhelmed. She left discouraged, and said that she felt like the store was just for rich people. That really surprised me, as so many of their items are REALLY cheap, and I’m not rich. However, the store is set up differently than most grocery stores, and they do definitely have a healthy/natural/trendy twist on just about everything, and I suppose it could be disorienting, and maybe even off-putting to newbies. Their meat is expensive; I almost never buy fresh meats from there. However, in my opinion, the pros of Trader Joe’s way outweigh the cons, and if you have a TJ’s near where you live, it is very much worth the effort to acquaint yourself with it.I have a fairly long list of must-have from Trader Joe’s but there are three particular items I would really miss if they became discontinued (which does happen from time to time, and without warning, at Trader Joe’s): Basmati Rice Medley, tri-color baby potato medley, and Spanish Extra-Virgin Olive Oil. 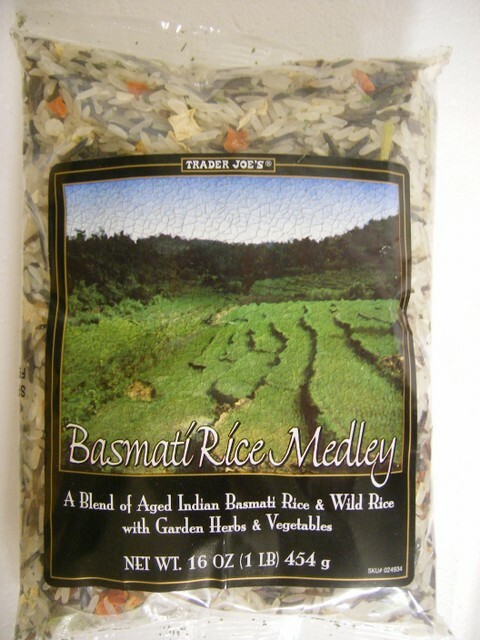 The Basmati Rice Medley cooks just as fast as normal white rice, even though it contains wild rice and is generously flecked with dried veggies. I almost never prepare it with straight-up water: pan juices from roasted chicken, olive oil and organic veggie bullion, broth made from Chicken Better Than Bullion… there are endless ways to prepare it. Each bag contains about 4 cups of rice (which, even in a big family like mine, is at least two dinner’s worth, plus leftovers), and is a steal at $1.69 per package. Where else can you make a healthy, good-sized, tasty, easy, quick side dish for under a buck??? Not many other places. Therefore, we eat this rice at least once a week. My only beef with it is that it contains a too-generous amount of dried orange peel. Orange ZEST would be great. CHUNKS of orange peel?? NO. When I make the rice, I fish through to weed out the orange peel. This is over my husband’s protests, as he likes the occasional shock of biting into the world’s most bitter mouthful of rice. Ugh. I don’t know the “official” name of the potato trio at Trader Joe’s — it just contains a mix of baby-to-small-sized Yukon gold, red-skinned, and purple potatoes. They are beautiful. And, at $1.99 for an 28 oz bag, really very reasonable. I saw a similar bag — a 16 oz package of Melissa’s organic Gemstone Potatoes for $3.99 in my regular grocery store. That’s more than three times the price of the TJ’s potatoes! Plus, any little bit I can do to save the world from the monoculture of the Russet is good by me. The recipe on the blog from which I lifted the above pic goes with a wonderful-looking veggie-potato salad recipe but I must say that my favorite way to serve these tasty tubers is to make a pouch of large, heavyweight foil, toss quartered potatoes with olive oil, sea salt, cracked pepper, thickly sliced onion, and an herb — fresh rosemary or dried thyme are my favorite — seal it up tight, and throw it on the grill over low heat for about an hour, turning once or twice. Mmmm… Caramelized onions, rich roasted color, potatoes infused with the flavors as they steam and sizzle in the pouch… It’s potato heaven. Ritter chocolate. I am a huge fan of chocolate: nice, deep, dark chocolate. I would say “the darker the better”, but I can’t eat straight-up unsweetened, so I guess I do draw the line somewhere. From time to time, when I’m grocery shopping, I treat myself to a bar of chocolate. My favorite, hands down, is German-made Ritter Sport. I’ve sampled a number of Ritter products, but my faves are the dark chocolate with whole hazelnuts or the dark chocolate with marzipan varieties. Either one, and I’m in chocolate heaven. Speaking of Trader Joe’s, they carry the dark-with-hazelnut kind, and it’s $1.99 per 100g bar (about 3.5 oz. For comparison’s sake, Hershey’s Dark comes in a 41g bar. ).